The NBC Nightly News recently featured a series of stories entitled “Back to Basics.” In those reports, folks from all around the country described how they were pairing down their lives to just the bare necessities. In one extreme case, a young man managed to get rid of everything in his life that couldn’t fit into two suitcases and a moving box. That is taking the idea of back to basics to extreme lengths. What about your own life? How much clutter are you surrounding yourself with? What would it take for you to get back to basics? This doesn’t mean tossing out everything you own, but what about the stuff you’re holding onto for no good reason other than you can’t do anything with it. Usually, this means old pieces of furniture that have served their purpose, but now need to be taken away. That’s when you should call in a furniture pickup team to help you get back to basics. The furniture we bring into our homes always starts out with the best of intentions. It could be a brand new matching sofa and loveseat that perfectly compliments the rest of the living room. It could be an inexpensive table picked up at a yard sale. It can also be a firm mattress. Years later, the only thing that matches on the sofa and love seat are all the stains from spilled food. That yard sale table has buckled. And that once firm mattress is now a lumpy mess. If you’re lucky enough to replace those kinds of items, often the old furniture finds a new home. This could be in the basement or out in the garage. Old furniture ends up hanging around because it’s just easier to tuck it away then haul it away. However, if you hire a furniture hauling crew it can be gone for good! When we think of furniture movers it’s usually the type we hire to go from house to house. They’ve got the big truck and they’ve got the muscles. It might seem silly to hire professional movers just to get rid of a sofa, but consider the alternative. You’ll be stuck with that sofa until your next move. Is that really something you want to live with? Of course not. You could always try to borrow a friend’s truck to haul it away, but then you would have to borrow a couple of friends also to get it into the truck. Once an old piece of furniture is loaded up on a truck would you know where to take it? You don’t want to just dump it by the side of the road because that’s not good for the neighborhood and you could be slapped with a fine. Those furniture haulers will know just where to take your old furniture – a recycling center. 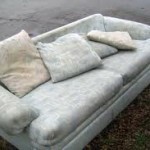 Junk King will be happy to remove your old furniture in an affordable, efficient and eco-friendly manner. Simply call 1-888-888-JUNK to schedule a free on site estimate. This entry was posted in Furniture Pick Up, furniture removal, Pick Up Old Furniture and tagged furniture disposal, furniture hauling, furniture pickup, furniture removal, get rid of old furniture on November 22, 2010 by Junk King. Last updated November 22, 2010 .